Watch Jack Russell Racing Videos Here! If you've never seen any Jack Russell racing videos, you don't know what you're missing. But not to worry, here are some fun videos you can enjoy. There's nothing like watching a Jack Russell give it all he's got. And I think there's nothing under the sun he loves more. These are working dogs and have in their genes a whole history of the fox chases of England waiting to be unleashed. For your pleasure. Just punch and play. 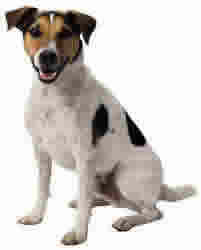 In this Jack Russell video the top 12 fastest Jacks in the Purina Incredible Dog Challenge. You have to appreciate the speed and athleticism of these Jacks. In these Jack Russell Racing trials from 2007 watch how these jacks are able to follow commands, burst through obstacles and speed through the race course. In these Jack Russell Racing Videos, you see our Jacks tackle some tough agility challenges. In this Jack Russell racing example they are 100% speed as they rush to the finish. Don't you just love these Jack Russell videos? You know, if you have a little jack that you think would be good at this and would love it, you ought to check into the National Trials in your state and see what is involved. You can find the schedule for Jack Russell racing and other events here. Is your dog tired of seeing you dish out the same food night after night week after week? Do those big brown puppy dog eyes of his cry out for change every time you open another can of horse meat and gristle? I downloaded "Healthy Food for Dogs: Homemade Recipes": and tried them on my Annie. She loves them. It's so nice to give her something different...and healthy! Your Jack will love you for it.